Citation: C N Trueman "Roman Houses"
Roman houses were so well built, if you were rich, that many examples of Roman houses exist throughout the Roman Empire. If you were poor in Rome, you lived in simple flats or apartments – the inside of these places was symbolic of your lack of wealth. These flats were known as insulae and only contained two rooms at the most. People tended to use them only for sleeping as they had to work, visit the baths (as their flats had no running water) and they usually ate in local inns as cooking in these flats was not safe. Rich family homes were very different. The rich lived in single-storey houses which were built around a central hall known as an atrium. Atriums had rooms opening up off them and they were also open to the weather as they had no roofs. Many atriums had a trough built into their design so that water could be collected when it rained. Beyond an atrium was a second open courtyard known as a peristylum. This area included a garden and it also had rooms opening up off it. In the homes of the wealthy, the gardens served as a meeting point and they were designed to be shady and comfortable so that people could meet in them regardless of whether the sun was fierce. 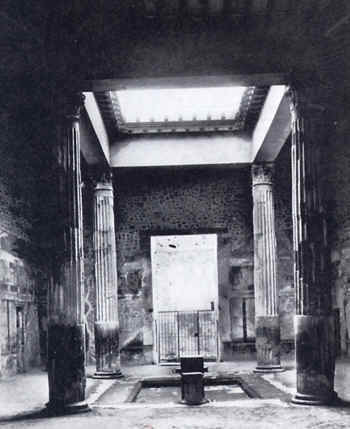 The main rooms were decorated with coloured plaster walls and, if they could be afforded, mosaics. These decorated floors were a statement of your wealth and importance. The grander mosaics had to be done by experts and they were expensive. A master mosaic craftsman would map out the picture while those who worked for him did the actual work in making a mosaic. 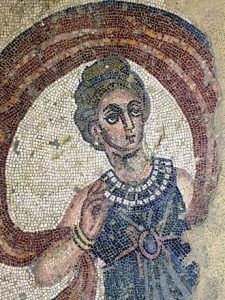 Probably the most famous Roman mosaic in Britain is at Fishbourne Palace in West Sussex. Though mosaics could be spectacular, furniture, even in the homes of the rich, tended to be basic. Stools were common as opposed to chairs and reclining couches were used. Beds were simple affairs with ‘springs’ being provided by leather straps that criss-crossed a bed frame. Houses also had water piped straight to them – unlike flats and apartments. Lead pipes brought water to a house. However, these pipes were taxed according to size – the larger the pipes, the more the tax. Archaeologists can usually tell the wealth of an owner of a Roman house by simply looking at the size of the lead pipes that brought water to that house. Houses were also centrally heated by what was known as a hypocaust. This was under-floor heating. Slaves were charged with keeping the hypocaust both clean and alight during the day. This system of heating was also used to keep some Roman baths hot if they had no access to naturally heated water. Some Roman villas in Britain have survived in such good condition that we have a very clear idea about how the rich lived and what their homes were like. When the Romans left Britain, it appears that some villas were covered with dirt to ‘trap’ into them the spirits of the Romans – thus, they could not ‘escape’. In 1960, a workman found substantial ancient building rubble at Fishbourne, West Sussex, while digging a trench. In 1961 a trial excavation took place and what was essentially a complete Roman villa was found. A huge variety of Roman homes can also be found at Pompeii, of course.